Sauna Infrared w Hotelu W Krainie Alicji w Nałęczowie. Relaks, poprawa kondycji skóry oraz utrata zbędnych kilogramów. The infra-red cubicle used the energy of IR radiation. The applied range of infra-red beams is safe and free of the harmful UV radiation. In the infra-red cubicle only 20% of IR energy heats up the surrounding air (to the temperature of 40-60°C) and 80% of the energy permeates inside the body (even 40 mm deep) and is transformed into heat, warming up the skin, joints, muscles, and body organs (in a classic sauna our body is warmed up only on the surface, with limited penetration inside). Increased penetration of infra-red radiation causes strong stimulation of the cardiovascular and immune system. It also reduces muscle tension and pain (increased production of endorphins). This treatment also helps reduce body weight, stabilise blood pressure, and detoxify the body. Infra-red cubicles are recommended to everyone who wants to become slimmer. An infra-red session is a passive training, fitness workout that increases our metabolism by approx. 40% without burdening our joints and intensive exercising. During one 30-minute session our body burns approx. 900-2400 kcal (equivalent of a 5 km run). The IR energy warms up the body directly, and not the air inside the room, like it happens in a classic sauna (the heat range is safe for the cardiovascular system), so there is no uncomfortable hot air effect , typical for a sauna, or ‘stuffy’ air caused by big amounts of steam in a Roman bath. Thanks to this, a session in an infra-red cubicle is not exhausting for the body, but comfortable and pleasant. 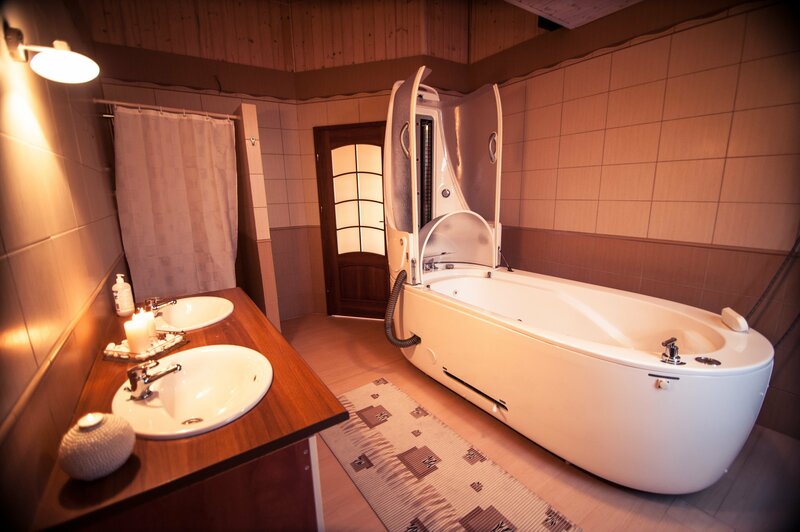 - sauna session takes place at a lower temperature below 60°C, so we can stay in it longer, up to 30 minutes, the infra-red beams warm up our body tissues up to 4.5 cm inside, and make us sweat intensively. During one session we burn up to 900 calories (equivalent of a 10 km run). - the skin is cleansed of toxins and looks better. - visible reduction of cellulite. - it is recommended by doctors in treatment of muscle pains, injuries, dislocations, joint diseases and circulatory disorders. - it reduces stress-related tension.